Click the button below to add the EP-BMK-ADD Magnum Battery Monitoring Kit pre-wired into Power Panel to your wish list. 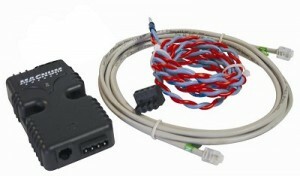 Monitoring your battery bank is easy with the Battery Monitor Kit (ME-BMK)* from Magnum Energy. Acting as a “fuel gauge” for your batteries, the ME-BMK monitors their state of charge (SOC) and then provides this information in an easy-to-understand display via the ME-ARC or ME-RC remotes. With accurate SOC readings, you can avoid unnecessary battery recharging, saving on fuel and long-term maintenance costs. If you already have a Magnum Inverter/Charger and Magnum Remote*, the ME-BMK is an easy retrofit. Simply install the kit according to the installation manual and begin monitoring your battery bank via the “Meter” button on your ME-RC.